Bye Wart!™ has been specially formulated for the painless and natural removal of all types of warts and verrucas (excludes genital warts) and comprises of natural active ingredients that offer a complete, painless and effective solution to warts. Bye Wart!™ functions by penetrating the wart and preventing uncontrolled cell growth. It deposits a layer over the wart or verruca stunting any spread and promotes the wart's removal and the skin's healing. Bye Wart!™ Suitable for diabetics and children over 3 years old. Also suitable for Vegetarians and Vegans. Warts are benign small hard growths on the skin, that appear when a virus infects the top layer of the skin (epidermis). The virus that causes warts is called the human papilloma virus (HPV). Warts consist of a nucleus of connective tissue with blood vessels, covered with layers of epithelial tissue (skin layer). Warts are harmless, but very contagious for yourself and others. Warts can grow anywhere on the body and occur singly or in groups. They are most common on hands and foot. Without further treatment, in 80% of cases, warts will disappear within a year or two. Warts are the most common skin infection and around 10 to 25% of the population suffer from warts. In some countries this percentage rises above 50% of the population. Warts are most common among children and people with a compromised immune system. The most common warts are the common wart and the verrucas, in 60% to 80% of the cases. Warts are caused by a virus known as the Human Papilloma Virus (HPV). The virus causes unusual and rapid growth of the skin cells on the outer layer of the skin (epidermis). The skin cells in the epidermis multiply more rapidly, which results in a hardened bulge on the skin. The appearance of a wart can vary depending on what part of the body it is, as well as how thick the skin is. Warts are often skin-coloured and feel rough, but they can be dark (brown or gray-black), flat, and smooth. There are more then 100 different strains of the Human Papilloma virus (HPV) and at least 60 are known to cause warts. Many people carry the virus, but not everyone will develop a wart. Warts can affect any part of the body, but most often they appear on the fingers, hands, arms, and feet. Warts also may occur in the genital area. Different types of strain tend to cause warts on different parts of the body. The virus that causes warts is contagious and can spread easily by direct contact and indirect contact from person to person or to different body parts. Direct contact through skin-to-skin and indirect contact by a surface that touched the wart and is infected. The incubation period (the time from initial infection until the wart appears) is about three to six months but warts can lie dormant for years. Even when the wart is gone, the virus remains in the skin. 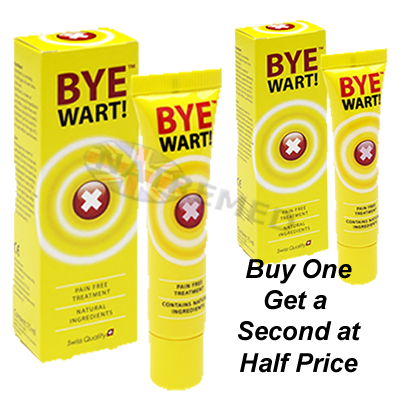 Bye Wart!™ is a cream with natural active substances that offers a pain free and quick solution for the treatment of warts. Bye Wart! contains various natural ingredients that each have their own proven efficiency in the removal of warts. Bye Wart! deposits a protective film layer of the wart, which protects the wart and allows the active substances to remove the wart and stimulate the healing process. Bye Wart! is easy to use and suitable for children and diabetics. Protects the wart from all negative external influences and further infection. Soothes the skin. Buy One Get a Second at Half Price.